I love when this happens.... article I've been meaning to write but haven't gotten around to. Authored by attorney Elaine Lee, who specializes in landlord-tenant law among other things. In Bay Woof this month. Thank you Bay Woof! While the Net is filled with great info for scoring pet friendly rentals, we really should be working just as hard to show landlords why responsible pet owners make some of the most mature, committed and long term residents. Tim and I are property owners and have lucked out with some of the nicest people on the planet in our apartments - including pit bull owners, of course. Their common denominator is that they all value making animals an important part of their lives, so have devoted themselves to making their rental a home rather than just a hopscotch landing pad. But we have the luxury of our years of rescue work to help us make match-up decisions. Without that experience, I imagine it could be difficult to know who to say 'Yes' to when scads of pet owners respond to a Pets/Yes ad. Hopefully Elaine's article will help other landlords find the confidence to give committed pet owners the home they deserve. For example: Is the dog under voice control? Is there genuine caring between each person and the dog? Is the dog at ease during interactions? Is there a lack of fear/cowering on the dog's part? Notice the temperament of the dog. Is he calm and content? If so, that usually means the animal is being well cared for and is getting enough exercise. I don't even consider renting to a person whose dog is pulling at the leash or appears hyperactive, because this can mean that the steward doesn't train or exercise him adequately. Check the work schedule of the person (people). I like to rent to couples who have staggered schedules so the dog has adequate care and company and is not left alone indoors for long periods of time. I also like to rent to people who work at home, come home for lunch, or take their dogs to work with them. Under no circumstances do I rent to people whose dog I haven't met. Despite great dog resumes, references, and pictures, there is no substitute for checking things out for yourself. 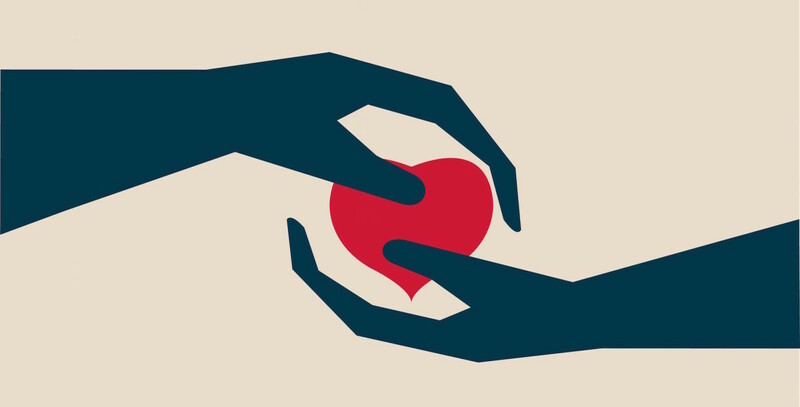 Regardless of the offers of cash or the pleading and promises, keep in mind that you are in the process of creating a long-term relationship with someone and their pet. You don't want to go through needless acrimony down the line with this or your other tenants, or with neighbors, much less a possible eviction proceeding if the dog does not live up to the hype. Make sure the prospective tenant's dog gets along well with the other dog(s) on the property. Once you have narrowed it down to a few candidates, try to schedule meetings where prospective tenants and their dogs can interact with your current tenants and dogs in a neutral setting, like a nearby park, or even on the sidewalk in front of the building. If the dogs get along well, they are likely to play together regularly, meaning the dogs get more exercise and the people can exchange pet care. This can make for happy, long-term tenants. Be sure to check out references. For novice property owners, it is a good idea to take the extra step of visiting the prospective tenants in their current living situation to see how they live with their dog. Fenced yards are a must. They prevent dogs from being cooped up indoors needlessly, decreasing the possibility of your property being damaged or soiled. I always allow tenants to install dog doors, if they want them. Make sure that prospective tenants walk their dogs at least once a day. This cuts down on dog waste in the yard and usually results in happier animals and people and nicer living conditions. Do not rent to people who plan to tie their dogs up in the backyard. More info from Elaine's article. Above: Carolyn Jones and her girl Penny (dog on left) have become an important part of the BR 'family' since answering our ad several years ago. Coming from the other side as someone who is trying to find the right pit bull-friendly housing right now, AMEN for this post! For other home-hunters, I cannot stress enough the value of a rental packet. Mine has 3 letters of recommendation about me and my pets from a vet, a trainer, and a former landlord, CGC copies, rabies certificates, photos, and my renter's insurance policy info with liability info highlighted. Also, ask to have your pets listed by name, weight, AND breed in the lease once you get lucky. No surprises makes for no sleepless nights. Many folks think it's okay to hide a dog or lie about its breed...it's NOT. You'll end up homeless (or more likely your dog will) and you make the rest of us look bad and make it even harder to find good housing. Your property is less likely to be robbed. With crime databases now available online, crimes committed on your property can lower your rental income and reduce the number of potential tenants. Our block is filled with dog owners and it correspondingly has a very low crime rate. Wow, I am not a renter anymore or a landlord, but volunteering at the Humane Society so many people can't adopt our Pit Bulls bc of the NO Pit Bull/mix around here! Its sad that I know people that have to lie about the breed. BSL is popping up a lot around here in Memphis. I too, have had difficulties renting with my Pit Bull. I was darn near homeless. 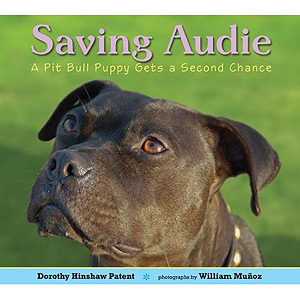 My Pit Bull, Dulce, has her CGC (from Our Pack), and I have previous landlord references, an EXTRA PET DEPOSIT, references from others, Vet, and trainers, and her own "resume". I HIGHLY recommend, if you are a Pit Bull owner looking for a rental, offer an ADDITIONAL PET DEPOSIT, if you can afford it. A Landlord wants to feel safe knowing you will fix any property damage your dog MAY cause. It's extra security for you. Also, have proof of Vaccinations, Rabies, License, Microchip, SPAY/NEUTER (a BIG one!) also! Penny was the LandLord of the BackYard. I've seen that beautiful pibble-girl 'collect rent' on many a disrespecting bully-grifter tenant. So, who wouldn't want her on their lot. Thanks for being a model renter. While I don't rent, I think the theme of this post applies in a lot of area - including traveling with your pet or taking them out to eat. To get more accommodations and restaurants to welcome pets means that we must train our dogs well and take responsibility when things don't go exactly as we've planned. Pitt bull owners generally have to jump through more hoops than those owning other breeds - but it would be better for all pet owners if everyone were as diligent! Just pointing out that the first bullet there suggest that landlords determine if there's fear on the dog's part. We wouldn't rule out renting to someone with a shy kid. Some dogs are just hesitant in new situations, and that's okay as long as the bond between parent and pup is strong and evident. No need for every dog to be an extrovert, to charge onto the stage and razzle-dazzle in a first meet. Good points, E. Altho a fearful dog does bring up other questions: "Does the owner recognize that the dog is a scardy-cat and if so, what kind of management plan would be in place?" Especially for times when strangers (incl kids) happen onto to the property. We are lucky enough to be renters who have such a wonderful landlord that he is supportive of us not only having our pitty baby but to let us be foster pit parents through AFRP in Monterey county. We have been fostering Penny, a 6 month old pit pup who had both of her front legs broken since February. Having the information from this article ready for potential adopters for Penny has been invaluable-passing along this info and all of bad-raps great info has secured Penny a wonderful new family who are renters (and who are extremely informed), and have an equally open-minded landlord. Thanks for all the great work, can't wait to see Penny with her CGC! Thanks for this great information. I will pass it along to my condo board, who recently passed a "one dog only" resolution which we are trying to get recinded. Anyone have thoughts on dog limits - by number, weight, etc. I kind of like the 100 lbs total pets limit. Also please keep in your thoughts our missing pit bull Berdina. Our situation was a little backward, but still interesting. We were punctual and polite tenants. We asked our landlord prior to looking for a sheperd mix puppy at a local shelter. They had a 20lbs weight restriction on all dogs, but due to our ability to be on time with rent and positive attitude we were allowed to have a larger than 20lbs dog in our apartment. Unfortunately our first pup had a congenital birth defect which caused us to have her put down. But following that we adopted a "pit bull mix" from a local rescue and the landlord also allowed us to have this dog, which was on their restricted breed list. Also, our landlord was one of our best references regarding the adoption application. It just goes to show how far punctuality and being polite can go! As a renter and PB companion, I appreciate this article. When we decided to adopt Babe, our landlord (who often watches his preschool grand daughters), was hesitant to say the least. Knowing him to be a dog lover, I convinced him to meet her. I knew no one could meet her and not like her, but he fell in love in the first 5 minutes. Now, I have to watch he and his family because they like to sneak her food, and whenever my husband and I are outside, the grand kids come play with her. We finally have convinced him Babe isn't the exception, but the rule. Now, he's talking to the shelter's PB coordinator, trying to find his own PB, who fits his family and will get along with Babe. So, for those landlords reading this, remember, don't reject some one because of a PB, you might be missing out on making a friend! I am a landlord, rescuer and pibble owner and lover. I rent to dog owners with no breed discrimination or weight limit. All my dog tenants are the best tenants! Pay their rent on time, clean up after their pets and are really great people. I sure wish there were more like me. Thanks to this article, hoping there will be soon! I don't agree with the "check their work schedules" comment, as my boyfriend and I both work the "regular" shift of 9 to 5. Our dogs still get three walks a day, and are not destructive when left home alone. That does not make us bad dog owners or bad renters. I also don't agree with the comment about fearful dogs (my Aussie is shy, but not fear-aggressive) or the comment about making sure the dog is dog-friendly. My Aussie is picky. So she's always on-leash. If another tenant allows their off-leash dog to approach her, despite my warnings, well, that's their problem. I was really hopoing for an article I could send to landlords when they say "No pets" or "No dangerous breeds." I'm disappointed. this is a great article that echoes many others i have read like it. one thing that is not often addressed is how to find a place that is willing to rent to you * before * you get an APBT. my g/f and i discovered shortly after we began dating that we both loved this breed and really wanted to adopt one...sooner rather than later. in addition to the usual hurdles encountered with this breed, we have also run into the problem of pet friendly rentals wanting to meet the dog beforehand...what if you are moving in so that you can finally get one?! does that mean you won't be allowed to adopt? maybe the landlord will be unwilling to take the risk? maybe after a period of being able to show we are responsible they may allow it? what if we have to move again because even though the rental is "pet-friendly" the landlord is not interested in taking on the risk of a new dog. just seems tricky to navigate since in that case a pet resume, training, and letters of recommendation would not be possible. 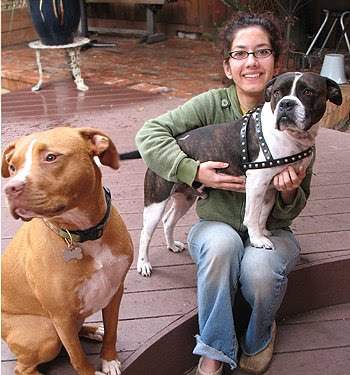 i wish this situation was discussed more in these "renting with pit bulls" articles. Colleen - I read the "check the work schedules" advice to mean that landlords should make sure the dogs' needs will be met no matter what. Puppies, for example, can't go unattended for 8 hours, but most adult dogs are fine with that. Any longer than 8-9 hours alone is a stretch though, given a dog's bladder size and exercise needs. This comment was interesting ... "If another tenant allows their off-leash dog to approach her, despite my warnings, well, that's their problem." Well, unfortunately that also becomes your landlord's problem if someone is hurt during a dog fight and decides to sue. This is why the insurance companies are so hesitant to cover dogs - as my insurance carrier just said, "a dog bite is a lottery ticket to many people." It's not fair, but it's a reality that property owners have to take into consideration in order to protect themselves from drama and loss. Hi Meagan - Speaking as a landlord myself who's been in this same situation, it really helps ease concerns if the tenant communicates really well with the landlord about their hope to get a dog and then, when the time is right, keeps them in the loop as they're shopping for a pet. You might even ask the LL to look at the website of the dog(s) you're interested in and help him learn more about the group you're working with so he can see that behavior and temperament are as big a concern you as it is to him. Researching the obedience classes you hope to sign up for and outlining your plans for dog care (crate training, exercise needs) is a big signal that you're going to be a great dog owner that he won't regret renting to. One of our recent experiences didn't go so well in one of our pet friendly apts. because a tenant insisted that a young and active great dane was the perfect pet for his very tiny place. His ideas about dog ownership were so unrealistic and he was so unwilling to hear our concerns about that that we felt it was necessary to completely block him from getting a dog altogether. That was so unfortunate because we had every intention of putting a dog on his lease, but we lost all faith when he pushed us against the wall and insisted that he knows best. Nobody likes being told what to do on either side of the fence. Perhaps you can make sure a clause is written into your lease that says "Approved dog up to X pounds will be added to lease at a later date" and then be awesome tenants and keep that line of communication going smooth so your LL will be happy to hear what you've found. Of course you want to make sure that this LL has had a history of renting to dog owners and/or that he actually likes dogs so you'll be supported every step of the way. Best luck to you with this! State Farm is on the list of companies that don't descriminate? That doesn't make sense. I left that company (I had been insured by them for 20 years) when I found out that they would cancel my coverage if I owned a pit bull or pit bull mix. They made that crystal clear to me when I renewed my coverage. So I just checked their website and in my state (Ohio), State Farm does discriminate. They state on their website that Ohio Pit Bulls are vicious dogs, so they do not insure Ohio pit bull owners. STATE FARM IS NOT PIT BULL FRIENDLY. Margie - All bets are off in Ohio because insurers can't cover dogs that have been deemed dangerous/vicious -- as is the case with pit bulls in Ohio unfortunately. State Farm is our preferred carrier and they really don't discriminate otherwise. One other thing to note: Individual agents have been known to block policies for pit bulls even when their parent company is breed friendly. If anyone runs into that, shop around and you'll find a policy with another (dog friendly) agent from the same umbrella company. This is great, even for a tenant like me! I'm graduating from college this May and will be having to move wherever a job takes me. I have a wonderful 70 lb pibble named Buddha (we're working on getting our CGC right now, and then hopefully Delta Society therapy certification). I'm actually going to put all of that extra info about him (vaccinations, training, and some reference letters, etc) into a packet that I can make copies of for any prospective landlord I find. I hadn't even thought about that. I have a pretty good relationship with my current landlord, and I was lucky to find out after signing the lease that he would let me adopt a pibble. He was hesitant only due to Buddha's weight and that it's an apartment, but since I'm responsible and pay my rent on time he was fine with it. The maintenance guys like him, anyway. Although I have to crate him when they're over because he'll bother them with sniffs and licks while they're working. I also have to agree about State Farm. I have renter's insurance from them, and the agent I went to was perfectly fine with my pibble so long as he had no bites in his history and was not being trained as a guard dog. We are allowing pit bulls and other restricted breeds into our apartments in the hopes that it creates education opportunities and builds advocacy for pit bulls and other dog breeds that have a bad reputation. We appreciate anything you can do to help us fill our apartment community with responsible pit bull owners and they "kids"! For every person that rents and mentions Bad Rap, we will be writing a $350 check to donate to the rescue!!! Wow Karisa, I sure wish we were in the same place. I'd come see you and the Greystone Apartments today. If anyone knows of any pit bull-friendly land lords in the Mountain View, CA area, by all means let me know. I am a leasing agent and property manager for a 260 unit loft complex. I am currently researching how to create a better pet policy. We currently have a breed restriction and limit large dogs to first floor apartments. I would like to get rid of the breed restriction because I think it is ill-informed and difficult to enforce. Here is my dilemma. When leasing at such a large scale, it is not feasible for me to evaluate each dog's temperament individually, nor am I really qualified to do so. We would like to encourage responsible dog owners to rent with us but at the same time discourage irresponsible dog owners (which there are unfortunately many of in our area). We have to establish some sort of consistent guidelines because otherwise we open ourselves up to lawsuits. 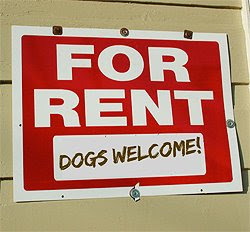 I would love to hear input from other landlords and dog owners. This will be a great lesson for landlords who must willing to take any responsibilities he must have. Thank you! My dog flourishes at home with his adopted sis and my husband and I. But when strangers come in the house it's something else. Unless we're in a neutral setting, he is pacing, VERY reactive and just a totally different dog. You can't judge a dogs character by their first meet and greet in my opinion. Especially if it's their territory. It may vary state to state but overall, they are non-discriminatory.